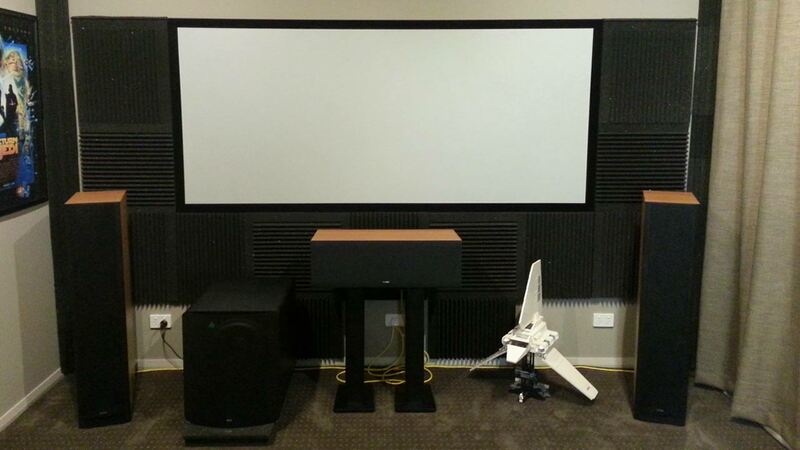 Shouwn contacted us recently to discuss his home theatre and moving to a 5.1.2 Dolby Atmos setup. 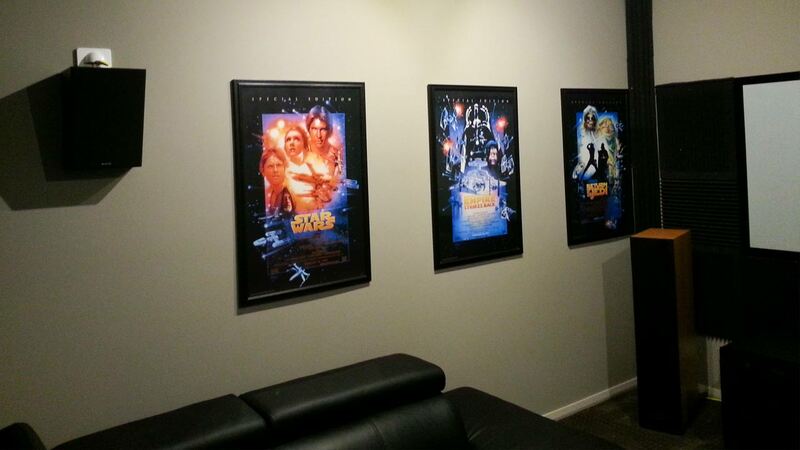 After a visit to the Krix factory, it was easy to see just how much he loves his music, movies and all things Star Wars! I am currently running a 5.1.2 setup utilising Krix Neuphonix, Vortex, Dynamix and Atmospherix A20 (for Atmos/DTS-X height channel), all powered by the new Onkyo TX-RZ900 A/V receiver. My other equipment includes a SVS PB2000 12 inch subwoofer sitting atop an Auralex Bass Dude subwoofer platform, a JVC DLA-X35 projector firing onto a Screen Science 96 inch cinemascope (2.35:1 aspect ratio) screen, an Oppo BDP-103D and Pioneer BDP-450 Blu Ray players, a NAD C545BEE CD player, Sony PS4 (Darth Vader edition), Strong PVR/STB and Apple TV. Interconnects comprise a mix of Audioquest, Monster and Analysis Plus cables and I’m using Liberty Tinflex four-core speaker cable for all speakers. Around 1993 when I realised that my sister’s Pioneer Karoake machine could also play Laserdisc movies. I quickly developed an appreciation for the video and audio quality that Laserdisc provided and this really sparked my interest in bigger and better TV’s and of course surround sound. The rest is history! 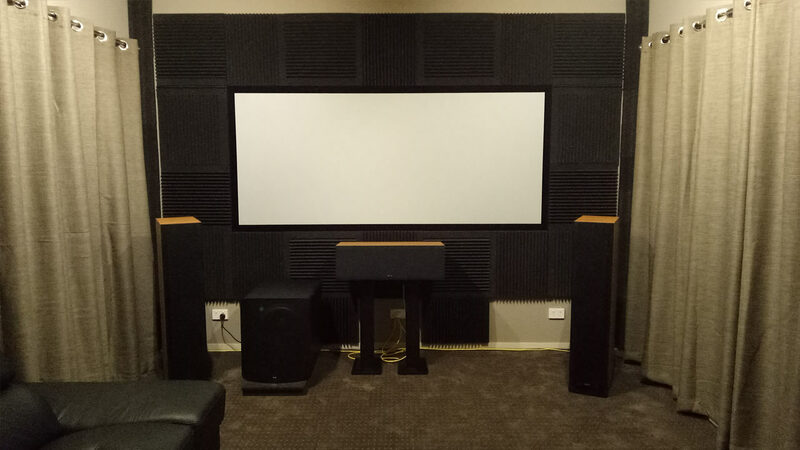 I have since owned numerous speakers, A/V amps and source players and experienced the evolution of surround sound from the old Dolby Surround to the object based audio that we have today (e.g. Dolby Atmos and DTS-X). What dimensions are your room? What challenges did you encounter when designing/outfitting it? Would you change anything and what is the next upgrade on the agenda? The room measures 5m (L) x 3.65 (W) x 2.7 m(H) and forms part of our recently built two-storey house. The biggest challenge I had was getting this size room in our relatively small house. The theater room is at the front of the house. Due to local council building requirements, I had to push the room back by 1m which meant that we lost part of the back of the room to the stairwell to upstairs. 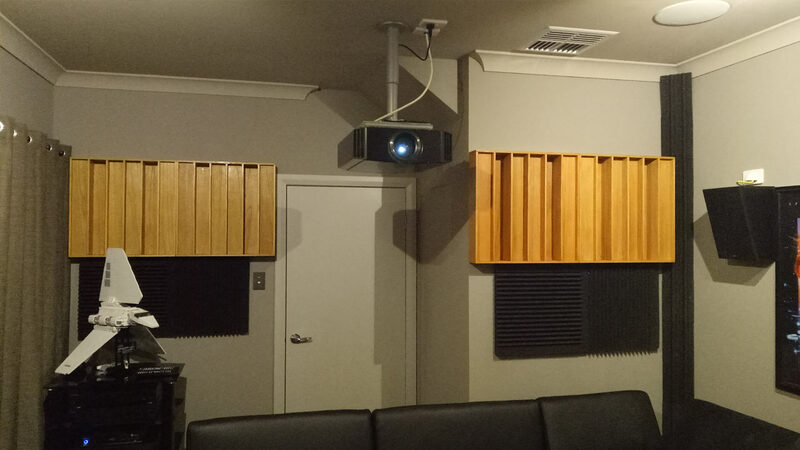 This meant that I couldn’t get a perfectly rectangular room, so it was challenging to set up a Dolby Atmos speaker arrangement (I ended up going with a 5.1.2 setup when my original preference was for a 7.1.4 configuration) as well as getting the room acoustically sound. 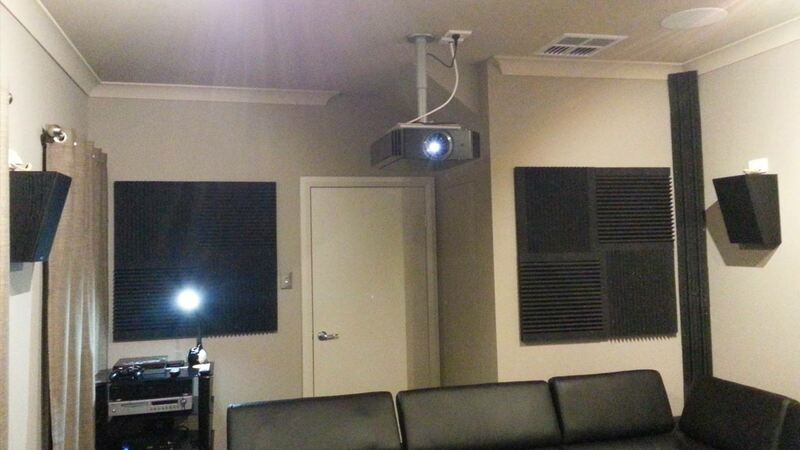 You’ll note that I have used acoustic treatment in various parts of the room to minimise sound reflections. Notwithstanding these compromises, the room has turned out surprisingly well. The sound is really good. I would describe the performance as very well balanced with nothing drawing undue attention to itself. When I watch a movie, or listen to my favourite CD, I’m fully absorbed in the soundtrack. The sound is very dynamic and detailed without being overly bright. Picture quality was also high on my agenda when designing this room. My criteria for this was simple – I wanted a high contrast picture that filled my field of view from the seating position while at the same time providing sufficient brightness and ‘punch’. To facilitate this, I used a darker paint colour for the room with a completely matt finish to minimise light reflections. Furthermore, the acoustic tiles I have used at the front of the room doubled as a nice masking around the picture that in turn has really improved the perceived contrast of the picture. Finally, I used a high contrast (grey) projection screen from Screen Science. This all makes for a beautiful, inviting picture that combined with the Krix sound, literally draws you into whatever you are watching. In terms of upgrades, I’m looking to add some Vicoustic diffusers to upper back walls of the room and immediately below the side surrounds to give a more diffused surround. A pair of Krix Volcanix Slim subwoofers would be reallly nice as well! A 4K projector and UHD Blu Ray player are also on the horizon but I’ll wait until the price of these come down (significantly!). I enjoy listening to both movies and music and I think that the Krix speakers are a big part of providing this enjoyment. The Neuphonix sound superb with pure 2 channel audio so I enjoy a good CD as much as the latest Blu Ray in Dolby Atmos surround. In terms of movies, I really can’t go past the Star Wars Trilogy Blu Rays, the Dolby Atmos demonstration disc, the last 3 Fast and Furious movies (i.e. 5, 6 and 7) and Terminator Genisys. In my opinion, all of these movies showcase the various strengths of my system. For music, I am really enjoying a variety of hi res music on my system at the moment – Dire Straits Brothers in Arms SACD is one album that particularly comes to mind. Edit 14/11/2016: Shouwn has been busy adding more acoustic treatment and curtains to the room and sent through the photos below.